On the eve of the 2016 elections, young Republican Megan Thompson faces a once-in-a lifetime opportunity when her boss decides to groom her to run for his congressional seat in 2018. Ambitious and pragmatic, Megan is missing just one thing: a wealthy, well-connected trophy husband. After a series of unpleasant blind dates, Megan begins to lose hope of finding her shiny white Republican knight in time to boost her appeal to donors and voters. At last she hits it off with Brock, a dashing, Don Draperesque spokesman for the NRA, and even love-shy Megan thinks he could be “the one.” But as the year progresses, she and Andrew start getting along a little too well, and Megan finds herself second-guessing all her well-laid plans. 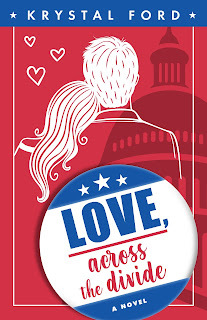 Love, Across the Divide follows genuine, familiar characters from both sides of the aisle, smashing stereotypes and striving to make sense of our not-so-brave new world. Most of all, it asks a crucial question: Can love bridge the great American divide?